Jackson safety glasses are popular products, and we carry models from several different Jackson product lines. Protective eyewear from Jackson features a rugged, professional look. Many of the Jackson safety glasses that we carry look professional and deliver excellent functionality. 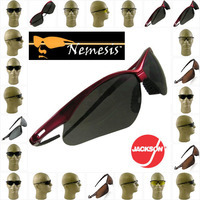 We have glasses from the Jackson Nomad, Nemesis, Nemesis Camo and Hell Raiser product lines. 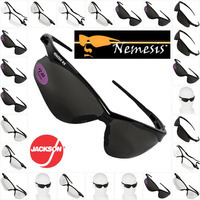 Some top products are the Jackson Hellraiser safety glasses. If you need glasses from this product line, we carry models with 3.0 and 5.0 lenses. 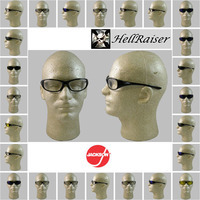 We also have models for the Hellraiser product line that have blue mirror, amber, clear or light blue lenses. When it comes to safety glasses from Jackson, we carry products with almost every type of lens imaginable, so you can find the glasses that you need for specific applications. 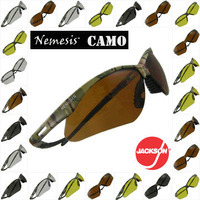 For a rugged look and feel, you might consider products from the Jackson Nemesis CAMO line. Our glasses from this product line have copper, clear, amber, smoke or anti-fog lenses. If style is very important to you, consider getting some Nemesis Polarized Safety Glasses with smoke or brown lenses.